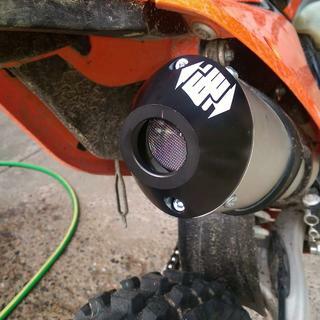 Enduro Engineering’s Spark Arrestor End Cap is the easy, effective, and attractive way to make your KTM, Husqvarna, or Husaberg one hundred percent spark arrested and legal for any trail. This end cap works with your stock silencer and a few screws to give you a USFS approved spark arrestor. 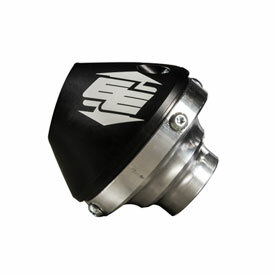 With such a simple and effective design this Enduro Engineering End Cap retains all of your bike’s power, is easily swapped out, and is easily cleaned. 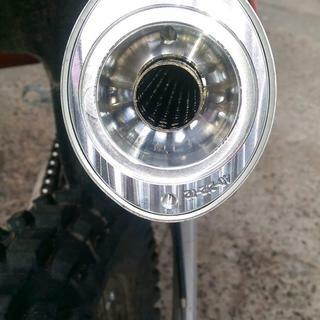 So if you ride both closed courses and public trails, save yourself the hassle of swapping out entire silencers and go with the Enduro Engineering Spark Arrestor End Cap. All it was supposed to be,,,very happy!! This is a great way to get your stock pipe spark arrested and not have to buy a complete silencer. Quality of materials is excellent, and I haven't noticed any power loss or change in sound. It took me a long time to install because I didn't have the right tools, but if you have them it should take about 30mins. You'll need a strong 3/16 bit (cobalt) and a powerful drill to drill out the rivets. After that the process is simple. I recently bought a KTM 300XCW and to my surprise, it doesn't come stock with a spark arrestor. I have bought several other Enduro Engineering products in the past and they have always delivered. Great addition to my bike ... also satisfied by Enduro Engineering. This was the best option for my bike, and the best pricing through Rocky Mountain ATV, even cheaper than direct from the manufacturer!!! Shipping was fast, and installation was easy. Definitely recommend. Bought this for my 17 KTM 150sx, I wanted to like it. It does it job as a spark arrestor, but it really inhibited my power and sounded horrible. Put on an FMF and was so much better. Installation was pretty easy and it looked cool, may be okay for non-race bike. Fit as it should shipped fast and did its job. Had no problem with my desert inspection with this screen. Its obvious this product was CNC machined to fit your pipe perfectly. Once I drilled out the factory rivets, it literally took me five minutes to install. And that was only because I cleaned the end of my pipe. You can install it in two minutes. It fit perfect and the pre-drilled holes lined up perfect with where the rivets were. Only two fasteners to remove so that you can clean your screen, and you can easily see the screen with a glance to see if it needs cleaning. I would recommend this product to all my friends. In fact my friend just asked me to see if there is one available for his bike while writing this review. Saves you a ticket - and presumably the forest. Cheaper than the other insert, but still pricey. The screen doesn't allow for a regular plug - has to be shorter. Maybe KTM will realize someday that a woods bike should come "Ready to Race" in the woods... Until then, if you ride at a place that requires a spark arrestor then its either one of these caps or a different pipe. I havent tried the more expensive "other" brand but this one- Enduro Engineering works perfect! This is a great product for the money. Cheaper than PMB ones and I think they are easier to install. Comes with drill bit. Looks great, better than stock in my opinion. Put this on my 2017 ktm 300xc. Fits perfect and works as it should. Not only do you get a great product but it also makes the stock silencer look better! Don't forget to clean it every so often. It will get gummed up. Works great! It looks Good, fits good, works well. Functional and a nice piece of billet workmanship. Like the other reviewers, you have to clean the screen often. I let mine go a little too long and almost did not make it back to the trucks. What is insidious is that it robs your power in small increments, so you really don't notice it too much then suddenly anything above 1/4 throttle is hopeless. It took a 2000psi power washer to get the screen clear. I'll either leave it out or replace the whole silencer. I use MotorEx at 50:1. This product looks pretty but it's a pain to keep the screen clean. Plan on removing and cleaning the screen after every ride. Mine clogged up on me after just the third 4 hr ride. Yanked it off and bought a Turbine 2. Problem solved no screen to clean and is USFS Approved spark arrestor. Don't try and save money with this product... You won't. Great product easy to install. Install went easy. I do not have long term experience with the screen yet, but my bike runs pretty clean. I do not like that I cannot use my exhaust plug anymore. The product does what it should - makes you legal in CA or other states where you need a spark arrestor. However, after only 4-5 rides, the screen got so clogged that the top end disappeared and after thorough inspection of the carb, power valve, etc., it turned out to be the screen in this little unit. I've read on the boards that this is fairly common and wish I had just bought an FMF spark arrestor for a little more. if you can afford a bit more, I'd recommend going that way -- otherwise, just make sure the screen is cleaned out often on thee EE end cap unit. The Endcap is a great product, looks good and performs well. The screen is easy to clean with solvent and doesn't rust. Was a bit tricky to install because the rivets on the factory Endcap can be tricky to get out. Then there's a thin O-ring you have to carefully install/hold on while you install it, I suggest putting some grease to hold it on. Other than that great performing product. Have yet to damage or scratch it. This is an easy install if you have a cordless drill and a small punch. Came with hardware that matched the lower bolts on the silencer. Looks good, works great, and it costs less than buying a spark arrestor type silencer. The design and finish is great and was rather easy to install. The spark arrestor screen clogged up within about 2-3 hours of riding. You will loose all your mid and top range power after it clogs. I couldn't even get the bike up a hill anymore. When it gets clogged, it prevents the bike to get into higher RPM's and sputters and backfires. Was fustrating to find this out after about an hour checking my carb and ignition to find it was something simple yet should not happen that quick. Average rider would not know to look for this. I really like EE parts, but this is the first dud so hurt me to rate this item so low. But reviews like this is what help people determine good from the bad. Easy to install and perfect fit. Looks great. Install was easy on stock silencer if you know how to use a drill and take your time getting the old end cap off. Would recommend and purchase again. Good spark arrester , but i have to clean it with gas after every ride or it plugs up with oil & dirt,. this cap works excellent,the fit and finish are superb cnc. I like it because I can use my stock muffler and keeps my my nice and quiet! the screen comes out real easy so u can clean it. it was very easy and straightforward to install. Just follow the easy directions and it also comes with everything required to perform the installation. it has worked great and i haven't had any issues after 8 months. great product to keep from 'riding dirty' in the public areas. will this fit a 2009 ktm 300 xc? will this fit a 2016 ktm 500 exc? BEST ANSWER: No, it will not. Can you run this without the screen when you don't need it?
. On two strokes you would need to clean the screen often. On four strokes not.. Yes, the screen is a separate part; but first you'll have to unscrew the hex bolts to remove the black endcap and remove the screen, then re-screw the endcap. Yes, you can. There are two allen screws you remove and the black tip comes off. Then, you can insert or remove the screen as needed. Yes pull it out when not needed. They tend to carbon up if left in and require periodic cleaning or bike performance may suffer. Yes you can, pop the end Off the screen popped out put the end cap back on. Yes, removing the screen is super easy. Literally a 2 minute process. I believe so however it won’t make any difference to performance. Yes, it can be used with or without the screen installed. I have not tried but I don't see why it would not work. I have. It may not be legal pending on where you live. Yes you can. It comes out quick and easy. What size o-ring does it come with? I'd like to buy a new o-ring for my end cap. BEST ANSWER: The end cap does not include an oring. It is made to reuse the OEM oring. If yours needs to be replaced the OEM part number is 0770740015. Can you run it without the screen when you don't need it? Does RM ATV carry the replacement spark arrestor screens for this EE end cap? BEST ANSWER: Unfortunately, we do not. Will this fit the 2017 KTM Freeride? I have a 2007 KTM 250 XCW with a FMF power core 2 silencer, will this fit? I have a 2007 KTM 250xcw with a FMF powercore 2 silencer on it. Will this cap fit? BEST ANSWER: It only works on OE silencers. Will this fit a 2017 ktm 65 Sf? BEST ANSWER: No it will not. We do not currently make one for the 65 model. I have a 2017 KTM 300 XCW Six Days, Will this fit my stock pipe? I don't see screws to adapt to this cap. BEST ANSWER: This will fit the Stock silencer. You will need to remove the stock end cap and the kit includes an insert that will allow you to install the black end cap. is there a special tool to remove the stock cap? BEST ANSWER: No special tool just a drill. The End Cap includes the correct drill bit to remove the rivets from the stock end cap and the new end cap bolts to the silencer.